Featuring 230 stallholders across homewares, textiles, fashion, furniture, lighting, stationery, lifestyle & kids products. You can also attend creative workshops, pick up showbags at $25 each, or take advantage of the free kids activities. White Hat suggests that you may find a number of items suitable for Christmas gifts that are not your run-of-the-mill department store fare. Adults $2 - children 12 and under free. Details at The Big Design Market. Sisters’ Market is a market founded by two sisters. They love finding diverse items that both inspire and excite. And let’s face it…they love to shop! The market features an array of stalls filled with artwork, clothing, accessories, food, body products, home wares and other quality goods. As White Hat predicted in our newsletter after we had attended their very first market "we expect this market to be around for a number of years to come and to build a build a strong community following". 10am to 4pm, selected Saturdays .. Brunswick Town Hall, Sydney Road, Brunswick ..
An indoor food market with a small number of permenant shops including butcher, deli & greengrocer. Trading days are Wednesday 7am to 4pm; Thursday 7am to 6pm; Friday 7am to 7pm and Saturday 7am to 1.30pm ..
Wednesday to Saturday .. 12 to 18 Chester Street Oakleigh, Oakleigh .. The Northside Makers Collective is a group focused on encouraging craft in the Northern Suburbs. Their markets, held on selected Saturdays, feature food, childrenswear, stationery, art and more. Market dates are 10th October 2009, 28th November 2009, 6th February 2010, 13th March 2010. ..
10,30am to 3pm, selected Saturdays .. Northcote Uniting Church, 251 High Street, Northcote ..
A once-a-year market with a variety of goods. ..
Quality New & Preloved Baby and Kids items for sale. One day only Sat 7th Feb 2009. 10 Holme Rd, Ferntree Gully. 9am - 2pm. Prams, toys, books, manchester, clothes, and heaps of new stock at heavily reduced prices. ..
9am to 2pm, Saturday 7th February 2009 .. 10 Holme Rd, Ferntree Gully ..
A market in a bush setting selling home made produce. Saturday before Melborne Cup and Saturdays of Queens Birthday and Australia Day weekends. ..
Meet some of the colourful personalities that grow a diverse range of fruit, vegetables & seedlings, produce chocolates, nougat, honey, wine, free range eggs, jams, ice-cream and so much more. There is a special twilight market from 5pm to 8pm on Wednesday 23rd December. ..
8.30am-12.30pm, every second Saturday .. Gateway Village, Lincoln Causeway,, Albury/Wodonga ..
Fresh & organic produce at Veg Out Community Garden. White Hat recommends a visit to this market if you are interested to see what can be achieved when a suburban bowling green is converted into a community vegetable garden. We should also mention that although the Veg Out title implies vegetarians only, omnivores are catered for. White Hat can recommend this as one of Melbourne's better farmers' markets, with a good atmosphere and a wide range. East Ringwood Carboot Market is a carboot market that carers for a moderate number of cars each month ..
First Saturday of month (weather permitting) .. Railway Avenue,, Ringwood East ..
White Hat can recommend this market as one of the most easily accessible from the city with a wide range of stalls and the nearby shopping and entertainment strip in Lygon Street to supllement a market visit. More details at Carlton Farmers Market. 8am to 1pm, 1st & 3rd Saturday of month .. Carlton North Primary School, Cnr Canning and O’Grady Streets, Carlton North ..
Marketto is an organic food & produce Market which takes place in the courtyard of Sweet Caroline Hairdressing Salon. Each Market there is a beautiful range of organic fruit and vegetables from Makin' Groceries, as well as a variety of other producers and makers such as local honey from The Urban Beekeeper, mushroom kits from Fungi Culture, organic baby food, olive oil, cakes and preserves. ..
9am to 2pm, 1st & 3rd Saturday of month .. 40 Sth Caroline St, South Yarra ..
White Hat suggests that if you are looking for a quiet Saturday afternoon you could try out the monthly market at the Evelyn Hotel where you will find clothes, handmade thingos random whatnots. You can and shop then buy a drink. On the other hand you might just buy a drink - a beer or a Bloody Mary depending on what you did the night before. Unlike other markets, we're sheltered from the upcoming winter weather. Stalls are cheap. While you are in he area you will probably want to visit some of the coffee shops in Brunswick Street and maybe call in at the Rose Street Artists Market. ..
noon to 5pm, 1st Saturday of month .. The Evelyn Hotel, Brunswick Street, Fitzroy ..
Buy fruit & vegies, cheeses, free-range eggs, breads, olive oil, & more directly from the producer. ..
At Vanity Fair Vintage Fashion Market you will find up to twenty five vintage fashion and accessory dealers from Melbourne, country Victoria and interstate with fashion and fashion accessories spanning two hundred years. On racks there will be small waisted Victorian gowns, fabulous beaded twenties dresses, immaculately cut forties suits, flared skirts from the fifties, minis from the sixties and even big shouldered eighties numbers while on tables there will be jewellery costing anything from a few dollars to a few hundred dollars, Leather handbags, scarves and shawls, patterns, starched linen, tea towels from far away lands, packets of stockings, card after card of buttons and bobbins and lace. and if you cannot find what you are looking for at the vanity fair market at Windsor, then it is more than likely that one of the dealers will be able to find it for you or offer advice as to where you will find what you are looking for. A small entry fee applies. ..
1st Saturday of month .. German Club Tivoli, 291 Dandenong Road, Windsor ..
What was once somewhat of an industrial wasteland Spotswood is now a vibrant and groovy seaside suburb. With a strong organic feel the Spotswood Farmers Market will be high on the must-do list for locals and residents of surrounding suburbs Yarraville, Newport and Williamstown. Kids will enjoy the petting zoo, jumping castle and face painting. Gold coin entry (proceeds go to Spotswood Primary School). ..
9am to 1pm, Ist Saturday of month .. Spotswood Primary School, Melbourne Road, Spotswood .. Regional fresh produce at an outdoor farmers' market. A small entry fee applies. White Hat recommends that if you are visiting this market with a young family that you consider making a day of it (or at least a half day) by visiting the nearby urban farm. For those interested in historic houses, White Hat can thoroughly recommend a visit to the neary Bundoora Homestead. If you do either of these you may need to remember to take a cooler to keep your fruir & vegies fresh. The market can be accessed by public transport by using the tram in Plenty Road. .. The Watsonia Neighbourhood House is a not for profit organization in the Watsonia community where people can come and participate in our various classes held at the House. Garden Setting, Sausage Sizzle, Some Indoor Stalls, Plants, Craft, Jewellery, Paintings for Sale and more. Bookings and Enquiries: phone 9434 6717 on Thursdays and ask for Gwen ..
10am to 1pm, 1st Saturday of month (except Jan) .. Watsonia Neighbourhood House, 47 Lambourne Road, Watsonia ..
A range of secondhand goods. All proceeds go to charity. ..
An outdoor market selling hand made goods and produce. ..
9am—4.30pm, first Saturday of most months .. Bundoora Sports Centre, ..
A small specialty market featuting craft, plants and other goods..White Hat can recommend a visit to this market even if it is only to enjoy the atmosphere created by a small suburban Masonic Hall. ..
9am to 1pm, 1st Saturday of month (March to Dec) .. Masonic Hall, Abbott Street, Sandringham ..
Buy your vegetables fresh from the farm and homemade cakes/biscuits. Browse the stalls get bric a brac, clothes, toys, crafts, plants, used kitchen ware ...etc at bargain prices. Whilst shopping enjoy a coffee, sausage and other delights. For information about stalls please contact 0422 976 276. ..
Over 50 indoor and outdoor stalls including jewellery, knitware, toys, scrapbooking,Asian handicrafts, aromatherapy, ceramics, soy candles, books, collectables, clothing, plants, produce, picture framing, hot food, speciality cakes, confectionary and children's activities. Proceeds to the Rotary Club of Sunbury's community projects ..
9am to 2pm, 1st Sat of month (except Jan) .. Leisure Centre - Elizabeth Drive, Sunbury ..
An outdoor market in the surroundings of the Dandenongs with a wide range of home made and locally produced goods. ..
Held at Elwood College and featuring over 40 stalls this market is organised by the same people who mange the St Kilda Veg Out Farmers Market ..
8.30am to 12.30pm, 2nd Saturday of month .. 101 Glenhuntly Road, Elwood ..
An outdoor market selling home made and home grown goods. (Please note - this market used to operate monthly but now only operates in November and December). ..
9am - 1pm, 2nd Sat of Nov & Dec .. 6 Mount St., Glen Waverley .. Featuring craft and other goods ..
9am-2pm, 2nd Sat of month plus four Saturdays in Jan .. , Port Fairy ..
An outdoor farmers' market which also has secondhand goods and entertainment. ..
A small outdoor market promoting tourism in the local region. ..
Held at the Mechanic Hall in the heart of Skipton (54kms west of Ballarat on the Glenelg Hwy). Hand crafted jewellery, concrete garden ornaments, natural soy candles, knitted clothing and quilts, crystals, hobby craft and wooden toys, plants and home baked goodies. New stall holders welcome. ..
9am to 1pm, 2nd Saturdayof month (Exc. Nov) .. Mechanics Hall, Anderson St, Skipton .. Featuring local and Victorian traders. ..
9am-4pm, 2nd Saturday of month .. Ballarat Secondary College, East Campus,, Ballarat ..
A monthly farmers' market that showcases the wine and produce of the great central province - right in the heart of Piper Street Kyneton. ..
8am-1pm, 2nd Saturday of month .. St Paul's Park, Piper Street,, Kyneton ..
A true Farmers Market. Situated on beautiful Lake Wendouree, the Ballarat Lakeside Market dishes up some of Victoria's freshest produce. While enjoying the live music you can sample & buy from up to 50 specialist boutique stalls featuring fresh fruit, herbs & vegetables, free range poultry and meat, deli style foods, regional wine, coffee, sausage sizzle and much much more. The Lake has never tasted so good. ..
9am to 1pm, 2nd & 4th Saturday of month (except December 2nd and 3rd Saturday) .. Wendouree Parade, Lake Wendouree, Ballarat (next to Pipers Restaurant) ..
A farmers' market featuring seasonal produce. White Hat suggests you make a morning of it and take in the cooking demonstrations and talks which take place every hour. This market has been accredited by the VFMA. 9am to 1pm, 2nd Saturday of month .. Sidney Myer Place (Rosalind Park end of Williamson St), Bendigo ..
Ballan is just a short detour off the Western Highway near Ballarat, and White Hat suggests that if you are in the area on the second Saturday of the month that you call in a buy some of the produce grown in the rich chocolate soil of the Ballarat/Ballan Area. Melburnians might even consider taking a V/Line train for a pleasant break in the country. This market has been accredited by the VFMA. ..
2nd Saturday of month .. Mill Cottage, 96 Inglis Street, Ballan ..
9am—4.30pm, 2nd Saturday of month .. Ballarat Secondary College, Ballarat, ..
Home produce, manure, trash & treasure., art and craft. Please note: We be beieve this market may now be defunct but have not been able to contact the organisers as yet to confirm this. ..
An indoor / outdoor variety market with over 150 stalla featuring bric-a-brac, second hand goods and a wide range of other products ..
Over 150 stalls featuring home baked goods, fresh fruit, vegetables and herbs (often direct from the farmer), toys, clothes, pottery, hand made gifts, plants,and books. White Hat recommends that anyone travelling along the Hume Highway on the second Saturday of the month makes the short diversion off the highway for a pleasant break. ..
8.30am to 1pm, 2nd Saturday of month .. Tulip Street, Violet Town ..
An indoor/outdoor market selling a range of goods including local produce. ..
An /indoor/otdoor market with over 60 quality handmade craft, plant and produce stalls. Theme is make, bake abd grow. Home cooked food available. Volunteer market and profits are returned for local community needs. The market runs on the 2nd Saturday of the month with some exceptions - check with organisers. .. The Farmers’ Market is held in the main carpark and picnic area with ample parking just metres away. The market is placcy bag free so BYO your trolley, baskets and reuse your own plastic shopping bags. ..
8am to 12.30pm, 2nd Saturday of month .. Coal Creek Community Park and Museum, Silkstone Road,, Korumburra .. The market is held in the grounds of Mont De Lancey Historical Home, Gardens & Museum situated in Wandin, where you will find Free range beef, Cakes and cookies, Artisan Bread, Wine tasting, Seasonal fruit & vegetables, Olives & Extra Virgin Olive Oil and much more. ..
9am to 1pm, 2nd Saturday of month .. 71 Wellington Rd, Wandin ..
An outdoor market with a wide variety of home grown and hand crafted goods plus train rides. 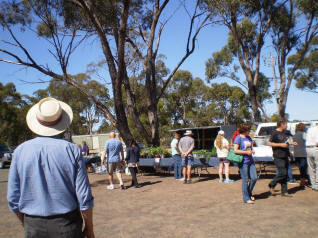 ..
A true community Farmers Market held on the picturesque Village Green in the heart of Metung. White Hat can recommend a visit to Metung as one of the more relaxing venues for a farmers' market in Victoria. ..
8am to 12.30pm, 2nd Saturday of month .. On the Village Green, Cnr. Kurnai Ave. & Metung Road, Metung ..
A farmers' market selling fresh produce from across the state. More information at Gaswork Arts Park Farmers Market. This indoor market is been curated by an artist-led viewing committee and showcases local Arts and Crafts. ..
10am to 4pm, 3rd Saturday of month, March to Dec .. Livingstone Community Centre, 1 Livingstone Street, Ivanhoe ..
An outdoor market in a pleasant grassed reserve featuring statewide produce including breads, olive oil, honey, fruit & vegetables. When White Hat last visited this market in July 2008 we found a good wide range of products with the fruit & vegetabls being particularly notable. ..
8am to 1pm, 3rd & 5th Saturday of month .. Patterson Reserve, Auburn Road, Auburn .. The market consists of 15 car boot stalls, 27 standard stalls, 4 food stalls, a kids craft area, and space for musicians and performers. ..
10am to 2pm, 3rd Saturday of month .. Fitzroy Primary School, George Street, Fitzroy ..
(Previously known as Yarraville Gardens Farmers Market, it has now moved to its new home in Beaton Reserve). Organic Fruit & Vegies, Eggs, Organic Breads, Olive Products, Wines, Plants incl Indigenous, Pestos/Dips, Organic Coffee, Cheeses . White Hat also suggests that while you are there you pay a visit to The Village Market next door in the Seniors Hall to browse the range of arts, crafts and upcycled wares. Further details at www.farmersmarket.net.au ..
9am to 2pm, 3rd Saturday of month .. Beaton Reserve, Fehon St off Anderson St, Yarraville ..
Fall in love with local food. When White Hat visited this market in August 2008 we found a good range of fresh produce in the very pleasant surrounds of Jells Park. Full details at www.rfm.net.au ..
A boutique market to indulge yourself with beautiful, unique and stylish items, giftware and plants. Relax in the tearoom over a cup of coffe or enjoy a barbequed sausage for lunch. ..
10 to 2pm, 3rd Saturday of month .. 177 Union Rd (cnr Montrose St), Surrey Hills ..
Set in the grounds of Fairfield Primary School, with up to 40 stalls of the freshest seasonal produce including artisan breads, coffee, eggs, flowers and plants, fruit and veg, herbs and spices, meats, pasta and sauces, olive oil, preserves, handmade soaps and much much more. Gold coin entry ..
8am to 1pm, 3rd & 5th Saturday of month .. Fairfield Primary School, Wingrove Street, Fairfield .. The Handmade Show is a community minded makers market in the South-East of Melbourne, Victoria, where crafters and artisans showcase and sell their wares. The Handmade Show is a non-profit group run by the stall-holders. We all do our part in making this market great! So jump on board this ride with us, become a follower, and share the love of making with us all. For more details and to apply to become an exhibitor please visit our blog: http://thehandmadeshow.blogspot.com/ ..
10.30am to 3.30pm, 3rd Saturday of month (March to Dec) .. St. Anthony’s Parish Hall Cnr Grange & Neerim Rds, Glen Huntly ..
A wonderful farmers market with over 60 stalls of fresh local produce direct from farmer/producer to you. ..
Art & craft in a family friendly atmosphere in a historical village setting. .. This market commenced in February 2013 and White Hat is particulary impressed that its monthly attendances are well over the 1300-1400 customer mark. It should be a good be a good omen that the school grounds now stand on what was once a market garden. This market has been accredited by the VFMA. 8am to 12.30pm, 4th Saturday of month .. Bentleigh East Primary School, 90 Bignell Road, Bentleigh East .. Featuring a wide range of fresh local produce direct from the Farmer/Producer to you. Fall in love with local food. Full information at Regional Farmers Markets. ..
An outdoor market with a range of goods. ..
Community owned - authentic - farmers market. Fresh local produce - veg - fruit - meat - cheese & other provisions for a more sustainable shopping experience. Free face-painting & music from local buskers.Come down with your bags, baskets and trolleys and support local producers. ..
"Make it, Bake it, Grow it, Sew it" with children's entertainment. .. Selling fresh regional produce from around Gippsland. This market is now operated by the Lions Club of Traralgon as from Sept 2008. ..
8am - 1pm, 4th Saturday of the month .. Bert Christensen Reserve, Kay St,, Traralgon (opposite the council chambers) ..
A farmers' market in the pleasant surrounds of Westernport Bay with produce including wine, fruit, vegetables and cheeses. ..
Fresh regional food straight from the farmer to you Full information at Mansfield Farmers' Market. 8.30am to 1pm, 4th Saturday of month (except Jan) .. Mansfield Primary School - Highett St entrance, Mansfield ..
An indoor/outdoor village market with an emphasis on fresh local produce. Also local art & music. The Barwon Heads market operates all year, the last Saturday of the month Feb – Nov. Weekly Dec and Jan but for 2010, not on Dec 25, or Jan 1st ..
Last Sat of month Fen to Nov then selected Saturdays through Dec & Jan .. Community Hall, Hitchcock Ave, Barwon Heads ..
A large outdoor market selling local produce & crafts, tools, plants and clothing. ..
An indoor/outdoor market selling bric-a-brac and other goods. ..